Have you been involved in a serious accident? Are you facing criminal charges? It can be daunting to find the right lawyer for either of these legal issues. Fortunately, the law firm of Carlson & Dumeer, LLC provides the quality representation you need for criminal defense and personal injury cases. Our firm has the resources and dedication to work hard for you. An experienced legal team, we maintain an extensive network of professionals to assist us in maximizing the outcome of your case. This means you can have an entire team of experts and consultants behind you when you work with our firm. Our Hartford accident and criminal law firm prides itself on persistence. We give each case our full attention and energy, and we never relent until we achieve the best possible results. You will never have to worry about the dedication of your criminal defense or personal injury attorney when you retain our firm. Moreover, both partners will work on your case, putting two lawyers in your corner instead of just one. In your time of need, we offer strong legal advocacy. Call (877) 795-5594 today to get started on your criminal defense or personal injury case in Hartford. When you future is hanging in the balance, let our attorneys fight for you! How Can Our Hartford Law Firm Help You? 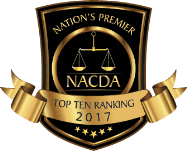 Our personal injury and criminal defense attorneys are each members of prestigious legal associations that include the American Association for Justice, Connecticut Bar Association, Connecticut Trial Lawyers Association and the National Trial Lawyers Top 40 Under 40. Attorney Scott Carlson is backed by a proven track record in personal injury and criminal defense cases, known for his client-focused service and active support of the local community. Scott formerly defended businesses and insurance companies in negligence and bad faith cases, and he now leverages his insider knowledge to help his clients obtain full and fair compensation. Attorney Brian Dumeer is trial-tested lawyer who is known for getting results in personal injury accident and criminal defense cases, and who is dedicated to serving the community. Brian formerly worked with the prosecution, and now that he works as a defender, he is armed with invaluable insight on how to proactively defend the accused. Why Choose Our Accident & Criminal Law Firm? We Gained Our Reputation from Hard Work and Persistence. Let Our Team Fight for You. “I cannot say enough about Carlson and Dumeer. I had the opportunity to work with them when I needed them the most. Both Brian and Scott were there to consult on my case. Anytime I had a question or needed advice they were on the phone w/in the 1/2 hour. It is so important when stress is running high to have someone there who you know that you can count on. It's not often these days that you can say that. I highly recommend this firm to help you when you need them the most.” - Lisa O.